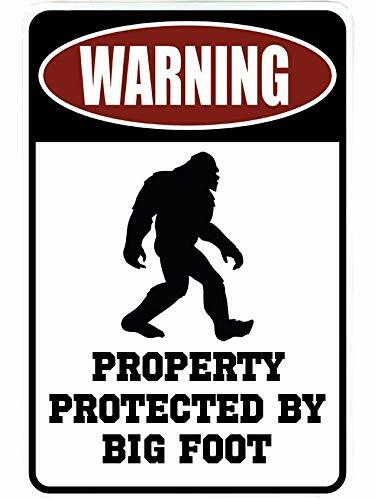 WARNING Property Protected by Big Foot - It is not a competition 12 inches high X 8 inches wide - Quality Aluminum Metal Sign - ¼" Pre drilled holes on top and bottom for ease of hanging - Made in the USA - Fast shipping on all signs - Extra UV protection added for outdoor use. Great novelty sign for expressing your unique personality for any occasion. Beware of China sellers with inferior quality copy signs and LONG Delivery Dates. SignDragon USA is the only authorized seller of this sign on Amazon.com. EYE CATCHING 12 inches high X 8 inches wide - designed to get the message across and to keep you smiling. DURABLE QUALITY aluminum metal sign you won't forget! Pre drilled holes on top and bottom for ease of hanging in your garage, man cave, wall or yard. PROUDLY MADE in the USA - Extra UV protection added for outdoor use. FAST USA SHIPPING on all signs. Makes a great gift. WARNING Property Protected by Big Foot - Packaged with Header Card and sealed poly bag. If you have any questions about this product by SignDragon, contact us by completing and submitting the form below. If you are looking for a specif part number, please include it with your message.